Every shop needs a grinder of some description but all benefit by having a fully capable one rather than low-buck “make-do” models. The JET 6” Shop Bench Grinder brings a full load of shop-tough features and capabilities at a surprisingly reasonable cost. Its heavy-duty design and construction mean that you can depend on this grinder for many years to come. The JET 6” Shop Bench Grinder (#JBG-6A) has a ½” shaft diameter that spins two 6” by ¾”-wide wheels at 3450-RPM. Two vitrified wheels, 36 and 60 grits are included. Power comes from a 1/2 HP, 115V, 1Ph motor. 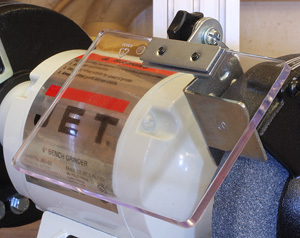 The JET 6” Shop Bench Grinder weighs 38-lbs and has a 17”-long by 10”-tall and 9”-deep space-saving footprint. Adjustable tool rests at each wheel let you work accurately and safely. The cast iron base (left) also has rubber feet that give is very good grip and deadens the sounds of grinding. The heavy duty shields (right) are tool-free and easily adjustable. Totally enclosed pre-lubricated ball bearings insure a long service life. 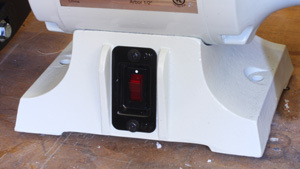 The base has rubber mounts to limit vibrations and unwanted movement. For safety the JET 6” Shop Bench Grinder comes with cast iron wheel guards with rear dust vents and quick-adjusting spark guards. Large easy to adjust shields help keep debris from coming at the operator. There is some assembly to get the JET 6” Shop Bench Grinder ready to go and that took all of 5 minutes to accomplish. For the most part this tool is nearly ready to go right out of the box. The tool rests, spark guards and clear shields are all adjustable so you can maintain effective clearances between them and the wheel as it wears. With those correctly positioned there really is little grit flying around but safety glasses remain mandatory. Anytime you have a round cutter (wheel) debris can come off at odd angles so you have to take common sense precautions. 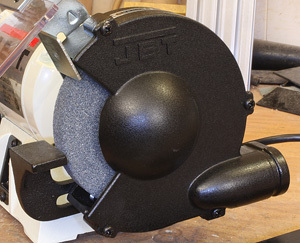 The JET 6” Shop Bench Grinder spools up smoothly and quickly then hums along quietly. The rubber cup-style feet on the base do a good job of keeping the JET 6” Shop Bench Grinder in one place and isolating any vibrations it does have from “rumbling” the cabinet it is on. The cast iron wheel guards have adjustable tool rests and spark guards along with rear exit debris chutes. The ½-HP motor is more than strong enough for all of the jobs we can expect a strong 6” grinder to handle. You can bog down any grinder if you lean on it enough but if you are at all reasonable the JET 6” Shop Bench Grinder cruises right through all of the grinding jobs I could come up with in my shop. Both the 36 and 60 grit wheels cut effectively and resist buildup well. You can produce a surprisingly smooth finish if you complete the job on the 60-grit wheel and lighten up on the pressure a little. This comes in handy when sharpening tools like chisels and drills. The SFPM (surface feet per minute) generated by the 3450-RPM motor lets you put a fine scratch pattern on cutting tools. That means a more consistent edge that will cut cleaner and last longer between sharpening. If the JET 6” Shop Bench Grinder has a deficiency I cannot find it. It handles everything I expect out of a shop grinder with ease and shows no sign of straining that could shorten its life. 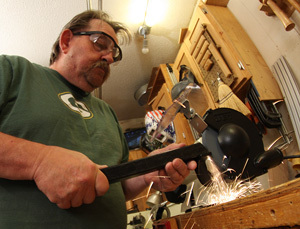 The stability and lack of vibration make doing even fine grinding work easier and more precise. I did some final grinding to bring parts into their final size and hitting a scratch awl mark without going over was simple. The JET 6” Shop Bench Grinder has a street price of around $152.00 (4-23-2014) which is not bad at all for a tool that should last a lifetime with simple common sense care. I went through a few of the $50-wonders the local big box store pushes but now with the JET 6” Shop Bench Grinder in the shop I can devote my tool budget to other things than replacing a cheap grinder. Save yourself some real money and get the right grinder first.